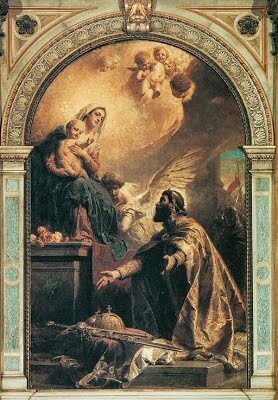 August 16 - Saint Stephen of Hungary - Optional Memorial - My Catholic Life! Saint Stephen of Hungary was a warrior king whose silhouette appears only faintly, standing on a distant horizon, as the sun rises behind him at the dawn of the medieval age. His year of birth can only be guessed, as ancient chronicles give conflicting dates. His father was of that generation of rough pagans who had to confront the new, vibrant force of Catholicism challenging the old ways of paganism and its local gods who satisfied local needs. The Mediterranean basin had long been Christian by the tenth century. But daring missionaries had recently penetrated deep into the wide plains of the Magyars, the Bulgars, and that vast land of the Rus that lay beyond. And that is when our saint comes on the scene. He was born Vaik, and baptized Stephen, when his father, a duke, converted to Christianity. When he was about twenty-two, he succeeded his father as a Magyar leader and warlord. After consolidating his territory and power through various wars, he sent an emissary to the Pope in Rome to petition for the founding of Church structures in his land. Pope Sylvester II concurred with Stephen’s plans and took him one step further. Tradition holds that the Pope had a crown fashioned for Stephen and sent it to Hungary, where the papal ambassador crowned Stephen king in 1001. King Stephen took his duties as a Catholic king with utmost seriousness. He founded an enormous Benedictine monastery, numerous dioceses, and mandated one tax-supported parish with a priest for every ten towns. He built a shrine to the Virgin Mary, which became the site of the coronations, and burials, of the kings of Hungary. He aggressively punished those who practiced the outlawed pagan customs of yesteryear and prohibited marriages between pagans and Christians. Interestingly, he required that all his subjects be married, except for priests and religious. After sadly familiar intrigues over succession, money, and power, Stephen died on August 15, 1038. Most of his children had died as infants, and his one adult son, his presumptive heir, died in a hunting accident in 1031. Thus Stephen’s efforts to establish a Christian state were placed in jeopardy. Just as Stephen feared in life, once the mighty king died, all of his accomplishments were neglected. Chaos and civil war raged for decades after his burial. The two ostensibly pagan kings who succeeded him were apathetic, or even antagonistic, toward Christianity. The fruits of Stephen’s Christian efforts rotted on the tree and his immediate legacy dissipated. Eventually, order was restored to Hungary and Stephen’s greatness was recognized. He was canonized in 1083. He is now a revered saint-founder of the Hungarian nation. The Huns, the Goths, and the Vandals don’t have a nation today. Over time, these pagan tribes were absorbed into the stable cultures they invaded. They melted into the many nations and identities of modern Europe. The Magyars, however, did not disappear. They did not merge with other peoples. They did not melt away. They have their own nation, Hungary, their own language, culture, art, and history. They owe their enduring identity to Saint Stephen. He imposed the stability of a first class religion on a horse riding clan and so transformed that roaming tribe into a stable nation. Stephen gave his people God. And to God and His Church they were faithful. Hungary matured over the centuries like wine, until it was a refined Christian nation, a defender of Christ and the Church. Neighboring tribes resisted the gospel and dissipated into thin air with the passing of time. Saint Stephen was a model King because he knew that to found a country you have to found a Church along with it. Saint Stephen, you bear the name of the first martyr of the Church and showed similar courage in battling the enemies of God. May your brave and visionary leadership embolden all civil and church leaders to lay the foundations for a success which flourishes long after they have died. GEYSA, fourth Duke of Hungary, was, with his wife, converted to the Faith, and saw in a vision the martyr St. Stephen, who told him that he should have a son who would perfect the work he had begun. This son was born in 977, and received the name of Stephen. He was most carefully educated, and succeeded his father at an early age. He began to root out idolatry, suppressed a rebellion of his pagan subjects, and founded monasteries and churches all over the land. He sent to Pope Sylvester, begging him to appoint bishops to the eleven sees he had endowed, and to bestow on him, for the greater success of his work, the title of king. The Pope granted his requests, and sent him a cross to be borne before him, saying that he regarded him as the true apostle of his people. His devotion was fervent. He placed his realms under the protection of our blessed Lady, and kept the feast of her Assumption with peculiar affection. He gave good laws, and saw to their execution. Throughout his life, we are told, he had Christ on his lips, Christ in his heart, and Christ in all he did. His only wars were wars of defence, and he was always successful. God sent him many and sore trials. One by one his children died, but he bore all with perfect submission to the will of God. When St. Stephen was about to die, he summoned the bishops and nobles, and gave them charge concerning the choice of a successor. Then he urged them to nurture and cherish the Catholic Church, which was still as a tender plant in Hungary, to follow justice, humility, and charity, to be obedient to the laws, and to show ever a reverent submission to the Holy See. Then, raising his eyes towards heaven, he said, “O Queen of Heaven, august restorer of a prostrate world, to thy care I commend the Holy Church, my people, and my realm, and my own departing soul.” And then, on his favorite feast of the Assumption, in 1038, he died in peace.